The original TomTom Golfer was one of Wareable's favourite golf watches, thanks to its super accurate distances, wealth of lay-up information and decent value. Now the company is back with the TomTom Golfer 2, and things have got serious. In addition to GPS data, the Golfer introduces automatic shot detection and scoring. It's a departure from the no-nonsense attitude of the previous Golfer watch and comes with a newly renewed version of the TomTom MySports app, which is now better designed for golf. But can TomTom register back-to-back birdies? We took to the course to find out what it was made of. The TomTom Golfer 2 shifts its design ethos to closely resemble the TomTom Spark. That means the familiar non-touch responsive LCD screen with the four-way control module protruding below the strap is present. One of our complaints with the original Golfer was the ease in which rounds could be cancelled inadvertently while you were playing. Aping the Spark design immediately solves that problem, and while the controls feel a little archaic, it's actually perfectly logical and easy to use. The screen itself is a 144 x 168 LCD affair, which won't be winning any prizes for display quality. It does the job however, with numbers and distances clear and easy-to-read. The Garmin Approach S6 has moved over to colour screens, but there's no real need for that here. It's a comfortable fit too, with an adjustable rubber strap, and we had no problems wearing it on multiple rounds. In terms of features, the TomTom Golfer 2 has built-in data on 40,000 worldwide golf courses. You can get distance to the front, back and middle of the pin, as well as hazards. However, there's also a new feature that's has the ability to automatically detect when you take a shot. More on that later. The final set of features are fitness related. You get a full breakdown of your steps out on the course, although activity tracking does fall short of the latest Garmin Approach X40, which uses a heart rate sensor to report your calorie burn for the day and also doubles as a running watch, too. Like the original, the Golfer 2 doesn't attempt to do too much. Short of the shot detection, it's a back to basics device, and that's okay by us. We're certainly the type of golfers who like to enjoy the game and have it enhanced by live on-watch stats, not get distracted by too much information. When you start a round you just hit the right button on the four-way control to start searching for courses. We found that the GPS was slower to get a lock on a course than a Garmin used on the same round, although it was nothing too drastic. Distance accuracy was top notch on the TomTom Golfer 2, and we didn't find any discrepancies in the data. Unlike the Garmin, however, you can't set the exact pin position on the green, so you'll always be choosing between front, middle and back. And for most golfers, that level of accuracy will be fine. On any hole you can see full details of dog-legs, hazards and lay-up information. Any dog-leg will be represented on the main screen with a crooked arrow, which is handy, and then you can swipe off to the left and you can get an overview of the hole. Covering the screen (you're prompted to do this) will zoom in for more detail, and you can use the four-way control to 'scroll' up the fairway. Hazard distances are clearly marked, with a hatched out patch for bunkers and a wavy line for water, with a yard scale down one edge. It's easy to read and immediately obvious what's ahead of you. Lay-up distances are shown for 150, 100 and 50 yards and there's also a green view that details the shape of the putting surface. It will also hatch out zones off the green that have hazards, so you can tell whether there's any dangerous traps lurking out of sight. In terms of the hazard and lay-up information, the TomTom Golfer 2 is one of the best golf watches out there. The detail is superb, and while the ability to move the pin position around the screen would be useful, it's a really easy to use system. This aspect of the watch truly excited us, especially with the confidence exuded by TomTom demonstrators when we first got hands-on with the watch. Auto-shot detection was easy, they said. Golfer 2 detects a shot from a location using built-in accelerometers. It doesn't matter whether that's a real shot or a practice swing – as long as it's at one location, that's your shot. Easy. The reality is far, far from easy. Out on the first tee we took a practice shot, and with a beep and vibration. A shot was detected. So far so good, and off we went. After a promising start on the first few holes of the round, we were subjected to constant buzzing from the Golfer 2 registering false shots. Typically this would be the actual shot, then the act of lifting up the golf bag would register another, followed by another four buzzes walking down the fairway. While some holes were perfect, at times it was incessant, sometimes registering 16 shots on one hole. We played three rounds with the Golfer 2, and automatic shot detection was a constant irritant. According to Golfer 2 we registered scores of 180, 140 and 78 (which in reality were 99, 99 and 87). During our final round the Golfer 2 was conspicuous by its absence – barely registering any real shots. The other issue is the lack of club detection. While Garmin devices prompt you to choose the club for every shot (you don't have to). However, TomTom doesn't collect any data about the club type, which reduces the effectiveness of the analysis. It's a big disappointment, and really undermines the Golfer 2 completely. You can turn the feature off, but why fork out for a watch with such a huge flaw. Of course, this is something that could be cleared up by improving software delivered via updates. We'd be happy to give this another try if TomTom fixes the issue, but anyone interested in this feature today would be advised to steer well clear. The TomTom Golfer 2 sees a big improvement in the MySports app, which is now built for golf. However, the automatic detection problems make it very hard to evaluate the usefulness of the system. With so many false shots registered, the data here was pretty much all junk. Shot distance averages for par 3/4/5s were completely out, greens in regulation (GIR) were meaningless, as were a lot of the tee shot patterns. However, complaining about data quality aside, the MySports app is pretty good – and actually trumps Garmin Connect for after round analysis. In the Rounds tab you can see your tee shot pattern, GIR and average number of putts, which is all worthwhile information for tracking your improving game, and working out what went well or wrong on the course. This is also tracked within the Stroke Analysis tab, where you can see averages across all your rounds, which where TomTom gets the edge over apps like Hole19, which isn't as good at providing an overview of your game. The final part of the puzzle is Ultimate Round, which takes your data from the courses you play and uses your best data from each hole, effectively giving you a glimpse of your potential, which is a great way of adding some positivity into your game. All in all, TomTom MySports is now a great part of the golf experience, and much improved. While data reliability is an issue, it beats Garmin Connect as a place to review golf data. The TomTom Golfer 2 is good for a couple of rounds, which should see you through even the longest day of golf. 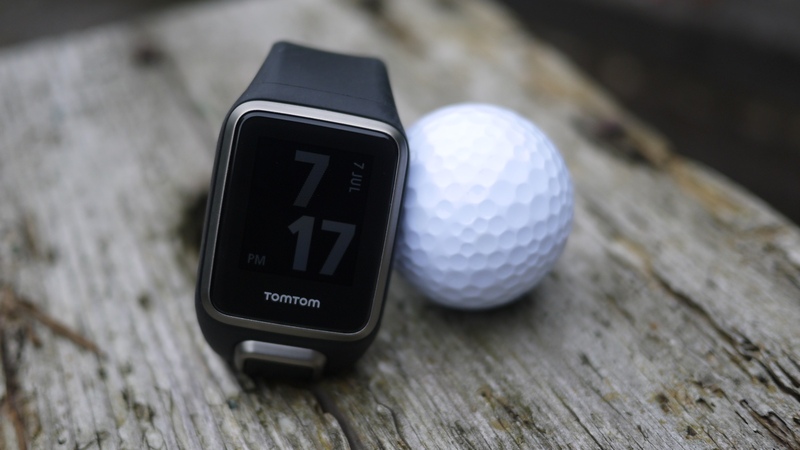 TomTom boasts 12 hours of golf, which was borne out by our testing. However, for those looking for the longest battery life, the TomTom falls short of the Garmin Approach S20's 15 hours of golf. What's more, the eight weeks of standby battery life meant that often we found the Garmin sitting in our golf bag ready to play, while the TomTom had expired. While we still look at the TomTom Golfer 2 affectionately thanks to the great app and the top hazard data, shocking experience with the automatic shot detection ruins the round. By adding such a large amount of junk data into the mix is a backward step for TomTom, and hands Garmin the advantage with its strong Approach S20 and X40 devices. Even if you turn off automatic shot detection, what you're left with is an expensive golf watch that only does the basics, which makes the Golfer 2 very hard to recommend.